The highest mountain peak on the North American continent is found in the US state of Alaska. Denali, previously known as Mount McKinley, rises to some 20,310 feet above sea level and is the most prominent feature in the state of Alaska. It was a natural choice for the reverse design on the ATB Series coin representing Alaska. 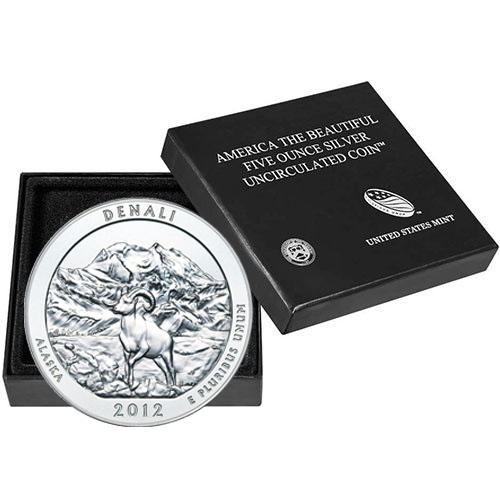 The 2012-P 5 oz Burnished Silver ATB Denali Coins are currently available to you for purchase online at Silver.com. Coins ship to you inside of protective boxes and include a Certificate of Authenticity! Fifteenth issue in the ATB Series and represents the fifth issue of 2012! 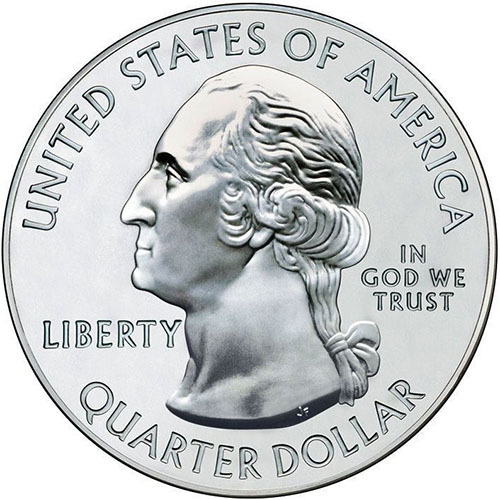 Obverse features the image of George Washington. 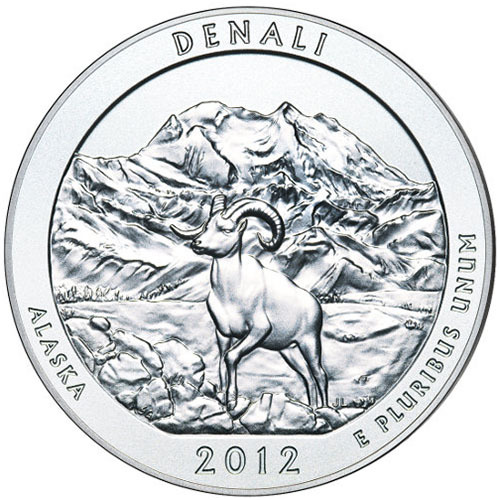 Reverse includes the design of Denali with a sheep in the foreground. Issued for Alaska in the ATB Series. Known to many modern-day Americans as Mount McKinley, the highest mountain peak in North America has been known to local Koyukon people as Denali. The mountain earned its American name from a pair of gold prospectors who came across the mountain in 1896 and named it for then-presidential candidate William McKinley, who would go on to become President of the United States. In 2015, the federal government reversed its standing on the name of the mountain and recognized it officially as Denali. As far as Denali National Park and Preserve, the land is centered on the peak at Denali and was established as a protected entity under the governance of the National Park Service in 1917. On the obverse of 2012-P 5 oz Burnished Silver ATB Denali Coins is the image of George Washington. This left-profile portrait of the nation’s first president was created in 1932 by John Flanagan for use on the nation’s circulation quarter. It remains there to this day as the longest-running US coin design. The reverse of 2012 Burnished Silver ATB Denali Coins features the image of the massive peak at Denali. The foreground includes a mountain sheep. Denali National Park and Preserve sees roughly 642,000 visitors annually as of 2017. These 2012-P 5 oz Burnished Silver ATB Denali Coins come to you inside of the original US Mint box and include a Certificate of Authenticity. Burnished silver coins in this series also include a “P” mint mark from the Philadelphia Mint, which is solely responsible for the production of the burnished version of ATB coins. We encourage Silver.com customers to contact us with questions about our silver for sale at 888-989-7223. You can also connect with us live online using our chat service or send us an email.